"MIDDLETOWN PLATE CO., Middletown, Conn. This business was started in 1864 by Edward Payne and Henry Bullard, making Britannia and plated ware under the name of Payne. It was part of the original group that formed International Silver Co. In 1899, the operation was moved to Meriden and merged with the Meriden Britannia Co. Employees who chose not to go to Meriden organized the Middletown Silver Co., which was bough eventually by R. Wallace & Sons, Wallingford, Connecticut. Middletown had a secondary trademark, Superior Silver Co., which was used on a less expensive line by Wilcox Silver Plate Co., until 1941. The Middletown Plate Co. trademark was also continued by International Silver until 1921." Often confused with the Middletown Plate Company, the Middletown Silver Company was a separate entity that formed in 1899 after the former was acquired by the International Silver Company and its production moved to Meriden. Online - overview page; certain newspapers and years are indexed. Russell Library, Middletown, CT.
Middletown Plate Co. (8 May 1868). Classified advertisement: "Salesman wanted— An experienced salesman to travel and sell by sample our silver-plated ware. Middletown Plate Co, Middletown, Conn." New York Tribune, p. 11, col. 5. (Viewed 18 September 2018. B00318). (8 March 1873). Wilmington has a first-class hotel! The Clayton House [with mention: "The plated ware, of fine triple silver plate, manufactured by the Middletown Plate Company, was furnished by C. F. Randolph." Delaware State Journal (Wilmington, Delaware), p. 2. (Viewed 18 September 2018. B00320-21). Online - Courtesy Philadelphia Museum of Art. Online - exhibit - Free Library of Philadelphia, PA.
Online - design - Free Library of Philadelphia, PA.
(10 October 1876). Centennial Business Notes; Silver-Plated Wares. The Evening Post (New York), p. 2, col. 5. (Viewed 14 October 2018. B01054). Middletown Plate Co. (21 September 1876). Advertisement: "Works of art in silver plated ware..." New York Tribune, p. 8, col. 6. (Viewed 18 September 2018. B00319). Middletown Plate Co. (October 1876). Advertisement: "Works of art in silver plated ware by the Middletown Plate Co. factory, Middletown, Conn., salesroom, 13 John St., New York. Centennial display, Main Building, near elevator, Philadelphia." The Evening Post (New York). (Viewed 14 October 2018. B01051-53). Online - NYS Historic Newspapers: 9 October 1876, presumably p. 2, col. 7; 11 October 1876, presumably p. 2, col. 7; 14 October 1876, presumably p. 3, col. 5. (10 January 1878). Legislative notes [with mention of Middletown Plate Co.] Hartford Courant, p. 2. (Viewed 21 October 2018. D00402). Online - Courtesy Metropolitan Museum of Art, New York (February 1878, p. iii; March 1878, p. v; April 1878, p. ix; May 1878, p. v; June 1878, p. v; July 1878, p. v; August 1878, p. iv). Online - Courtesy Metropolitan Museum of Art, New York (October 1878, p. vii; November 1878, p. vii). Middletown Plate Co. (6 November, 9 November 1878). Advertisement: "Superior silver-plated ware, manufactured by the Middletown Plate Co., 13 John-St., New-York". New York Tribune. (Viewed 21 September 2018. B00347-48). Online - Chronicling America project, Library of Congress: 6 November 1878, p. 8, col. 5; 9 November 1878, p. 10, col. 6. Augustus Conradt, assignor to Middletown Plate Company. (24 September 1878; filed 17 July 1878). Letter patent no. 208,373: Improvements in jewel-caskets. (Viewed 13 March 2018. AAA01113). Augustus Conradt, assignor to Middletown Plate Company. (19 November 1878; filed 12 October 1878). Letters patent no. 210,012: Improvement in jewel-caskets. (Viewed 13 March 2018. AAA01114). Offline (microform) - Russell Library, Middletown public library, CT.
Middletown Plate Company. (January 1879). Advertisement: "... offer a full assortment of their superior electro-plated ware..." [with illustration of jewel box]. The Jewelers’ Circular and Horological Review, p. v. (Viewed 30 August 2018. B00294). Middletown Plate Company. (c. February, March 1879). Advertisement: "... superior silver-plated ware. New designs..." [no product illustrations]. The Jewelers’ Circular and Horological Review. (Viewed 30 August 2018. B00296; E00233). Middletown Plate Company. (c. April 1879). Advertisement [with illustrations of water set with tray]. The Jewelers’ Circular and Horological Review, p. v. (Viewed 30 August 2018. E00236). Middletown Plate Company. (c. May 1879). Advertisement [with illustration of six-piece tea set and tray]. The Jewelers’ Circular and Horological Review, p. v. (Viewed 30 August 2018. E00241). Middletown Plate Company. (c. June 1879). Advertisement [with no illustrations]. The Jewelers’ Circular and Horological Review, p. v. (Viewed 30 August 2018. E00245). Middletown Plate Company. (c. July - December 1879). Advertisement: "... Superior silver plated ware..." [no illustrations]. The Jewelers’ Circular and Horological Review, p. vii. (Viewed 30 August 2018. E00249). Middletown Plate Company. (c. July - December 1879). Advertisement: "Superior electro-plate! ..." [with nine product illustrations: four butter dishes, two pickle jars, cake basket, and two casters]. The Jewelers’ Circular and Horological Review, p. iv-v. (Viewed 30 August 2018. E00251). Middletown Plate Company. (c. July - December 1879). Advertisement: "Superior electro-plate! ..." [no illustrations]. The Jewelers’ Circular and Horological Review. (Viewed 30 August 2018. E00256; E00262). Middletown Plate Company. (c. July - December 1879). Advertisement: "New designs for fall of 1879..." [no illustrations]. The Jewelers’ Circular and Horological Review, p. ix. (Viewed 30 August 2018. E00267). Middletown Plate Company. (c. July - December 1879). Advertisement: "New designs for fall of 1879... ’Merry Christmas’ and ’Happy New Year’ ..." [no illustrations]. The Jewelers’ Circular and Horological Review, p. ix. (Viewed 30 August 2018. E00276). Click the following link to see the parallel webpage - Middletown Plate Company in collections, at auction, and in exhibitions. Middletown Plate Company. (c. January 1880). Advertisement: "Spring season 1880..." [no product illustrations]. The Jewelers’ Circular and Horological Review, p. xi. (Viewed 31 August 2018. E00273). Middletown Plate Co. (7 August 1880). Advertisement: "The Middletown Plate Company, manufacturers of superior silver-plated ware. New designs for fall trade, Show Room, 13 John St., N. Y. Factories, Middletown, Conn." New York Tribune, p. 8, col. 6. (Viewed 18 September 2018. B00322). Bullard & George, presumably Watertown, NY. (4 October 1880). Advertisement: "Solid and silver plate ... Middletown Plate [Co.] ... " [with no illustrations]. Watertown Times (Watertown, NY), p. 1, col. 7. (Viewed 14 October 2018. B01075). (23 July 1881). A week of pleasure. Successful meeting of the Carroll County Trotting Association... [with mention: "The handsome prize won by the Maryland team was made by the Middletown Plate Company..." (below scores section)] The Democratic Advocate (Westminster, MD), presumably p. 3, col. 3. (Viewed 18 September 2018. B00323). Dillingham & Co., Fort St., Honolulu. (25 November 1882). Advertisement: "... Holiday presents... silver plated ware from the celebrated factories... Middletown Plate Co., among which are many designs entirely new to this market..." The Daily Bulletin (Honolulu) (supplement), presumably p. 4, cols. 3-4. (Viewed 18 September 2018. B00324). Henry Bullard, assignor to Middletown Plate Company. (20 March 1883; filed 24 January 1883). Letters patent no. 274,263: Ice-pitcher. (Viewed 13 March 2018. AAA01115). (3 June 1884). Donations to the Garfield Hospital (with mention of "Middletown Plate [Co.] ... contributed the silver-plated ware". The Rock Island Angus (Rock Island, IL), p. 1, col. 3. (Viewed 22 September 2018. B00363). Online - Courtesy Metropolitan Museum of Art, New York (January 1884, p. v; February 1884, p. v). Middletown Plate Co. (1885). [Catalogue and supplement]. Number of pages unknown. (No copy known to be in a public library). (Viewed 8 September 2018. L00721-22). Online - citation - (October 1885). Trade gossip (including paragraph about Middletown Plate Co. and current line, and supplement to 1885 catalogue). The Jewelers’ Circular and Horological Review, p. 297. Courtesy Metropolitan Museum of Art, New York. (October 1885). Trade gossip (including paragraph about Middletown Plate Co. and current line, and supplement to 1885 catalogue). The Jewelers’ Circular and Horological Review, p. 297. (Viewed 8 September 2018. L00721-22). E. v. Seutter, Jackson, Mississippi. (May - July 1885). Advertisement: "... Middletown [Silver] Plate Co., (every visitor will recollect their gorgeous Exhibits at the Great Philadelphia Centennial) ..." The Clarion (Jackson, Mississippi). (Viewed 22 September 2018. B00364-68). Online - Chronicling America project, Library of Congress: 29 April 1885, presumably p. 3, cols. 8-9; 27 May 1885, presumably p. 4, cols. 8-9; 17 June 1885, presumably p. 4, cols. 8-9; 8 July 1885, presumably p. 4, cols. 8-9; 15 July 1885, presumably p. 4, cols. 8-9. Online - citation - (August 1886). Trade gossip (including a paragraph on Middletown Plate Co. and their new catalogue). The Jewelers’ Circular and Horological Review, p. 242. Courtesy Metropolitan Museum of Art, New York. (16 October 1886). At Quinnipiac range; award of prizes [with mention of "a handsome silver-mounted vase" by Middletown Plate Company as a prize]. Morning Journal and Courier (New Haven, CT), presumably p. 2, col. 2. (Viewed 21 October 2018. B01175-76). Middletown Plate Co. (c. 1888). [Catalogue]. Number of pages unknown. (No copy in a public library known to exist). (Viewed 6 September 2018. C00265). Online - citation - (September 1888). Trade gossip (including paragraph that Middletown Plate Co. "are about to issue a new catalogue"). The Jewelers’ Circular and Horological Review, p. 96. Courtesy Metropolitan Museum of Art, New York. (7 March 1888). In Middletown factories [with mention: "... 150 [persons are employed at] the Middletown Plate company..." Morning Journal and Courier (New Haven, CT), presumably p. 2, col. 4. (Viewed 30 September 2018. B00596). (May 1888). Trade gossip ( including mention that the Middletown Plate Co.’s New York office has moved to 22 John street). The Jewelers’ Circular and Horological Review, p. 85. (Viewed 8 September 2018. L00727). (June 1888). Chicago briefs (about Middletown Silver Company and its new store in Chicago). The Jewelers’ Circular and Horological Review, p. 40. (Viewed 6 September 2018. C00255). (June 1888). Trade gossip (about Middletown Silver Company and its new store in New York). The Jewelers’ Circular and Horological Review, p. 98. (Viewed 6 September 2018. C00256-57). (August 1888). Trade gossip (with mention of Middletown Plate Co. and their new New York store). The Jewelers’ Circular and Horological Review, p. 91. (Viewed 8 September 2018. L00728). (September 1888). Trade gossip (including paragraph that Middletown Plate Co. "are about to issue a new catalogue"). The Jewelers’ Circular and Horological Review, p. 96. (Viewed 6 September 2018. C00265). (October 1888). Trade gossip (with mention of Middletown Plate Company and their current New York display). The Jewelers’ Circular and Horological Review, p. 107. (Viewed 8 September 2018. L00731). For other maps, see Middletown area maps online at Yale University library. Lamoreaux, the Jeweler, Oil City, PA. (9 January 1890). Advertisement: "... Silver Plated Ware... My stock is new... Middletown Plate Company..." [with no illustrations]. Oil City Derrick (Oil City, PA), p. 8. (Viewed 23 January 2019. D00712-13). (July 1890). Trade gossip [with paragraph on new goods by Middletown Plate Company]. The Jewelers’ Circular and Horological Review, p. 88. (Viewed 4 September 2018. F00244-45). (6 September 1890). Local news; brief mention ["The Middletown (Silver) Plate company is driven with orders and the men are working extra hours..."] Morning Journal and Courier (New Haven, CT), presumably p. 2, col. 1. (Viewed 13 October 2018. B00999). C. H. Gilman, Red House, Sacramento. (12 November 1890). Advertisement: "... Middletown [Plate Co.] 4-plate hollow-ware..." [with no illustrations]. Sacramento Daily Record-Union, p. 1, col. 1. (Viewed 10 October 2018. B00927-28). C. H. Gilman, Red House, Sacramento. (22 December 1890). Advertisement: "... Middletown [Plate Co.] 4-plate hollow-ware..." [with no illustrations]. Sacramento Daily Record-Union, p. 1, col. 1. (Viewed 10 October 2018. B00929-30). Middletown Plate Company. (February 1891). Advertisement: "... Superior silver plated ware..." [with illustrations of mirror, three brushes, and comb]. The Jewelers’ Circular and Horological Review. (Viewed 1 September 2018. B00288; B00292). Online - Courtesy Metropolitan Museum of Art, New York: 4 February 1891, p. 13; 11 February 1891, p. 5. Middletown Plate Company. (1892-93). Illustrated catalogue of superior silver plated ware - standard goods. 180 pp. (Viewed 28 July 2018. C00203-02). (16 January 1894). Doors of the new YMCA building open with a blaze of glory [with mention of Middletown Plate Co.]. Peony Press (Middletown, CT), p. 3, cols. 2-3. (Viewed 24 October 2018. B01201-04). Offline - on microfiche at Russell Library, Middletown, CT.
(17 January 1894). Middletown; Some exhibits at the Y.M.C.A. fair. Hartford Courant, p. 8. (Viewed 23 October 2018. D00319). Emil Steinmann, Sacramento, CA. (December 1895). Advertisement: ".... Middletown [Plate Co.] ... We sell silver plate that wears..." [with no illustrations]. The Record-Union (Sacramento, California). (Viewed 6 October 2018. B00791-94). M. D. Barnes, Receiver. (21 September 1896). Advertisement: Receiver’s sale, stock of Empire Jewelry Co., no. 705 Second Av., [presumably Seattle]... Middletown Plate Co.’s Quadruple Platedware... " The Seattle Post-Intelligencer (Washington), p. 5. (Viewed 30 September 2018. B00598). M. D. Barnes, Receiver. (22 September 1896). Advertisement: Receiver’s sale, stock of Empire Jewelry Co. ... Middletown Plate Co.’s Quadruple Platedware... " The Seattle Post-Intelligencer (Washington), p. 5, cols. 5-8. (Viewed 30 September 2018. B00599). Middletown Plate Company. (1 March 1898). Advertisement: "The Middletown Plate Company... 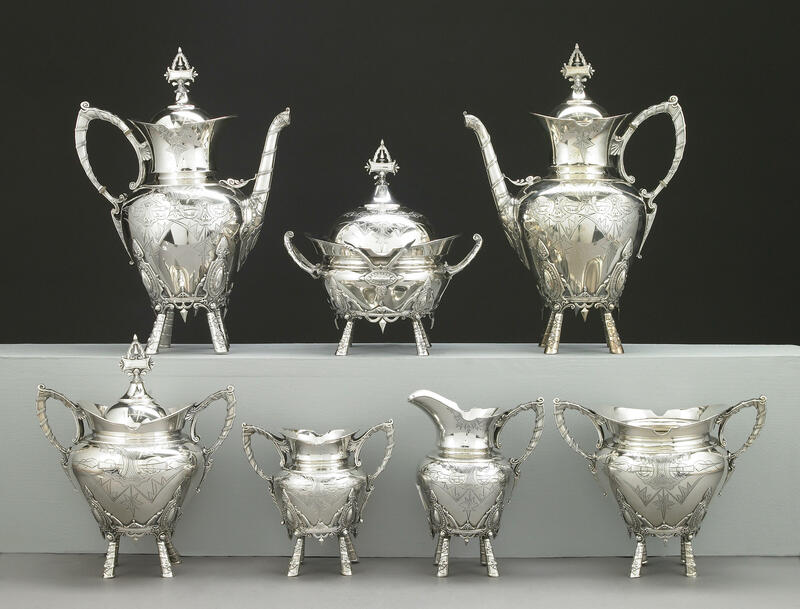 Invites the attention of the Trade in Foreign Countries to a Superior Line of Plated Wares..." [with illustration of no. 949, French coffee set, ebony handle]. American Jeweler, p. 67. (Viewed 18 December 2018. D00461). Middletown Plate Company. (24 August 1898). Advertisement: "... represents the highest grade of silver plate hollow ware..." [with illustration of five-piece tea set and tray]. Jewelers’ Circular and Horological Review, p. 37. (Viewed 3 September 2018. C00211). (22 May 1899). Sold to the silveware trust [with mention of Middletown Plate Company and International Silver Co.] The Evening Post (New York), p. 3, col. 2. (Viewed 17 October 2018. B01110). (15 September 1899). On the co-operative plan; former employes of Middletown Plate Company organize company. Journal Courier (New Haven, CT), p. 1, col 7. (Viewed 13 October 2018. B01006). (5 February 1900). [No article heading; listing the Middletown Plate Company as "Factory S" of the International Silver Company; the company has "gone out of their old place of business and merged into the Meriden branch..."]. The Daily Morning Journal and Courier (New Haven, CT), p. 1, col. 7. (Viewed 29 September 2018. B00566-67). United Press. (25 October 1910). Henry Bullard [formerly head of Middletown Plate Co.] dead. The Bridgeport Evening Farmer (Connecticut), p. 2, col. 7. (Viewed 30 September 2018. B00600). (9 January 1927). Hospital benefit to be style show [with recollection of c. 1884 benefits which included the donation of silver by Middletown Plate Company to Garfield Memorial Hospital, Washington, DC]. Evening Star (Washington, DC), p. 25, col. 2. (Viewed 30 September 2018. B00601-02). > p. 142 (toiletware - handmirrors, etc.). (c. 1998 - 1 June 1999). Rum, rubber & rattraps; A history of local enterprise at the Middlesex County Historical Society, Middletown, CT. (D00312; H00404). According to the MCHS director, an unspecified coffee pot by Middletown Plate Co. (private lender) was exhibited.